Who doesn't love a fresh manicure, with a pretty sparkly polish. I am in such desperate need of a mani & pedi, can't wait to get my toes done this weekend. This morning I was doing my rounds on Pinterest and saw the cutest nails. The colors and speckled glitter reminded of Easter eggs. Have you peruse Pinterest for nails and polish....OMG I can spend hours looking at the designs and colors. Nail polish has sure come a long way. I remember back in my youth when the most daring of polish was black, or a little glitter. Oh remember when french manicures were ALL the rage. Yeah that's so old school, now you can literally have any color and design imaginable on your nails. If you don't believe me just do a Google of Pinterest search for nail polish and be amazed at what pops up. For today I leave you with these pretty colors from KB Shimmer and Lac Attack, which I think are perfect for Easter/Spring. When it comes to nail polish I have to admit, not being so brave and crazy with color. I usually stick to dark colors or neutrals. The trend now is bright colors and designs, from polka dots, to stripes to even textures. When it comes to polish colors whats your favorite? Are you bold and daring? Safe and traditional? Do you go long or short with your nails? Leave me your comments and feedback, I love reading what you have to say! BTW way notice the new layout. What do you think? Thanks Moe! 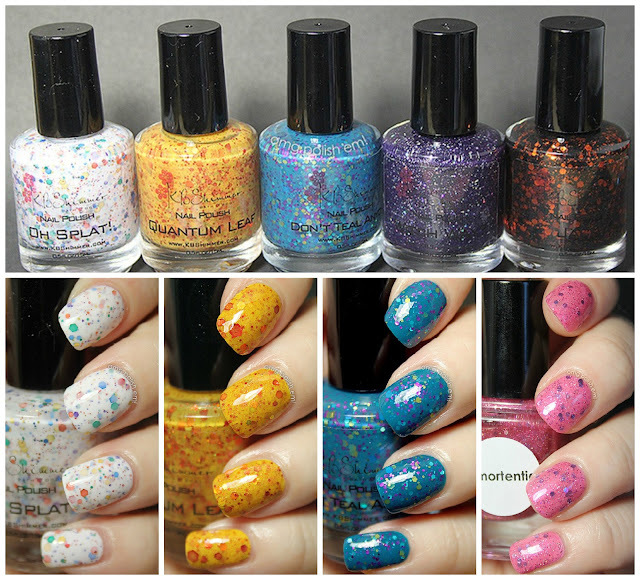 I so want to get one of these polishes, so cute!